"We appreciate all the attention, but when your own people say you did a good job I get tears in my eyes," said 15-time Stellar Award winning Smooth Jazz/Gospel pianist Ben Tankard about his nomination for a 50th NAACP Image Award. Winners will be selected when it airs live on TV One from the Dolby Theatre in Hollywood on Saturday March 30, 2019. Ben was nominated for his latest album release "Rise," featuring Paul Jackson, Jr., Kirk Whalum and Marion Meadows. Tankard's "Rise" was released in late 2018 and aside from a nomination from the NAACP Image Awards the album reached #2 on Billboard's Jazz Radio Chart. The project also features 1LV, Dejuan Williams, Kyle Schroeder, Unlisted Number and Neb Draknat. Ben Tankard is hailed as the "Godfather of Gospel Jazz". He is a pianist, drummer, guitarist, percussionist and music producer. In 2018 he received the Stellar Awards' "Hall of Fame" honor. He also has a reality show that has been airing on the Bravo Network, but will return on another network which Ben says is a more family oriented network. "What I can say is it will be named "The Tankards' or ‘Bigger Than Ever'," Ben said about his reality show. "We finished season three with Bravo. We're moving on ...to a family oriented network, which I can't tell you about yet. There was a comfort level with Bravo on CBS, but when God say do something... I was with Sony for 16 years and was scared to move out...but five years later I had the #1 record in the world of Jazz." 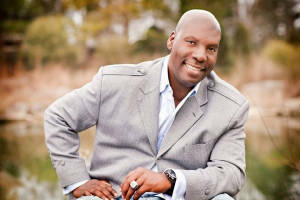 Ben Tankard's label Ben-Jamin is now distributed by Universal Music. He has worked with Gerald Albright, Fred Hammond, John P. Kee, Take 6 and Kelly Price - to name a few. He signed Yolanda Adams to his label when she was a 3rd grade teacher and credits her for bringing his music to a wider audience. To hear him play you realize why he is honored so much. His musical talent is unquestionably a gift from God. Once homeless Ben Tankard's reality show "Thicker Than Ever: The Tankards" is very popular and shows the now wealthy Jazz mogul as a family man - husband and father. Ben and his wife Jewell started the Destiny Center Church in Murfreesboro, Tennessee in 2002 - his father who was a minister and his mother a missionary. The NAACP hosted its 50th NAACP Image Awards Nominee Luncheon recently at the Loews Hotel in Hollywood, California to put the spotlight on talent that was nominated for a possible win at this year's NAACP Image Awards to be aired live on TV One at the Dolby Theatre in Hollywood on Saturday March 30, 2019, hosted by Anthony Anderson ("Black-ish"). I covered the red carpet arrivals and I had a chance to talk with some of the nominees, such as the event's co-host Major ("Better With You In It") nominated in three categories - Outstanding Male Artist/Traditional Song/Best Album; Emmy winning Lynn Whitfield-Green (HBO's "Josephine Baker Story") nominated for Outstanding Supporting Actress for the series "Greenleaf"; Tracey Bing, producer of Nappily Ever After, which was nominated for Outstanding Independent, and Sheryl Lee Ralph (CBS ‘Fam"), who co-hosted the event with Major. "I'm co-hosting with the queen right here," said Major during the red carpet arrivals. "I'm super honored...I'm up for three nominations. Ya'll pray for me. I'm just living the dream." Nominations for this year's NAACP Awards are led by Bruno Mars and H.E.R. who received five; followed by four nominations for Beyonce' for The Carters (plus "Entertainer of the Year"), Ella Mai (Interscope Records) and Academy Award winner Regina King (Enemy of the State). Those with three nominations include John Legend, Major, Kendrick Lamar, Childest Gambino, Michael B. Jordan, Saana Lathan and John David Washington. Of those who received two nominations Lebron James, Janelle Monae, Toni Bracton, Koryn Hawthroen, Tori Kelly, Rupaul, Queen Latifah, Jada Pinkett-Smith's "Red Table," Russell Hornsby, Winston Duke and Trevor Noah were among them. 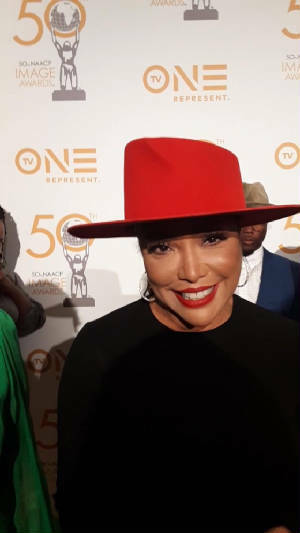 "I'm nominated for best supporting actress for ‘Greenleaf'," said Golden Globe nominated Lynn Whitfield-Green during the red carpet arrivals. "And I am part of the cast of Nappily Ever After. This is Tracey Bing who produced the film and it's nominated for best Independent Feature Film. I'm just honored to be involved in two projects honored by the NAACP...it's exciting." Tracey Bing added about Nappily Ever After nominations, "And best actress (Sanaa Lathan)." When I asked her about casting the iconic Lynn Whitfield Bing she said, "We always wanted Lynn to play the role of Paulette so it's a dream come true and we're so happy to be here and so honored to be nominated for two awards....it's incredible." The 50th NAACP Image Awards Nominee Luncheon was held to put the spotlight on "all" nominees with food, fellowship and entertainment, before the winners are announced live on March 30th on TV One.